← DO TOP INCOME EARNERS PAY THE TOP TAX RATE? WITHDRAWAL OF TAX CREDITS LEAVE PEOPLE ON LOW WAGES PAYING 73% MARGINAL TAX RATE, AND ON MODERATE WAGES PAYING 83% MARGINAL TAX RATE. London, United Kingdom. 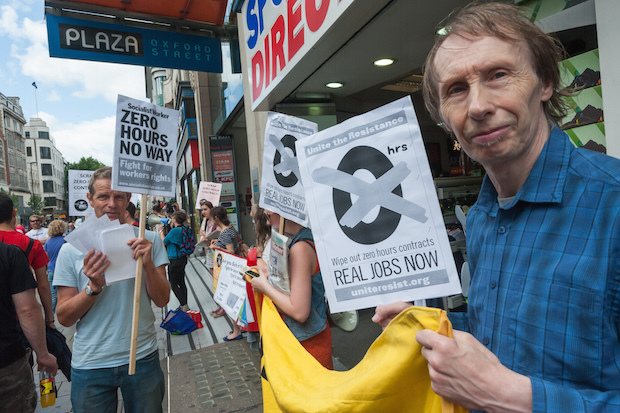 3rd August 2013 — People hold placards in Oxford St London protest against use of zero-hours contracts for more than 85 percent of Sports Direct workforce. Could you live on a zero-hours contract? David Cameron was forced to admit, during his grilling by Jeremy Paxman, that he couldn’t. But 1.4 million Britons do. Some out of choice, some through necessity. But the latest attempts by the main parties to tackle the injustices of zero-hours contracts fail to get to the heart of the problem – which has nothing to do with a need for ‘flexibility’ and everything to do with dodging tax. Many of us might be horrified at the thought of not knowing when our next pay cheque will be coming and how much it will be, but large numbers of people on zero-hours contracts are perfectly happy without that job security. Surveys have repeatedly revealed that the majority of people on zero hours contracts don’t believe they are being exploited by nasty bosses. Many students, mothers with young children, retirees and others say they enjoy the flexibility as much as their employers do to say ‘No’ to work when it doesn’t suit them, without any penalty. However, not all zero hours contracts are the same. The coalition government, led by Business Secretary Vince Cable, was right to ban exclusivity clauses in zero hours contracts, a move which will help 125,000 workers (roughly 10 per cent of the current zero-hours workforce) who have been banned from taking work elsewhere while being given no guarantee of work by their supposed main employer. Now Labour leader Ed Miliband wants to go further and to ensure that anyone on a zero–hours contract is automatically entitled to a regular contract after three months. On the face of it, this sounds like a good idea, offering protection from unscrupulous employers, but all it will mean is employers ending their contracts after 90 days to avoid that entitlement.That’s because politicians fail to understand what really lies behind the explosion in zero-hours contracts. We are told that the growth of these contracts is about employers wanting flexibility to cope with seasonal changes in customer demand and, in times of economic uncertainty, an opportunity to hire more staff without worrying about the costs of making them redundant if the economy takes another downturn. But that’s not entirely true. For a start, much of the growth in zero hours contracts has been in the care home sector, where there is absolutely no seasonal fluctuation at all and, with an ageing population, little chance of demand dropping off any time soon. Another major area of growth has been in the retail sector where, admittedly, there is some seasonal fluctuation around the sales, but not nearly enough to justify the way some major firms are using zero-hours contracts. A growing list of high street chains — from JD Wetherspoons to Burger King, Domino’s Pizza, and McDonald’s – are now effectively using zero-hours contracts as their default contract for new staff. And Sports clothing retailer, Sports Direct, is reported to employ an extraordinary 90 per cent of its staff on zero-hours contracts, suggesting that sports clothing must have one heck of a seasonal fluctuation. Meanwhile, Argos, Homebase and Tesco, along with many other household names, have all been accused of exploiting their staffby splitting previously full-time jobs into a number of separate part-time jobs, guaranteeing only a few hours of work a week. And this is where we get to the truth. Because not only does an employer enjoy far lower bills for holiday and sick pay entitlements, as well as pension contributions, for zero hours and part-time employers, they enjoy other benefits too. The employer’s National Insurance contribution liability doesn’t kick in until an employee earns £156 or more per week, so many companies now ensure they limit employees’ hours to below that threshold. When extra hours are available, instead of offering more hours to existing part-time staff, some of whom are desperate for full-time work, these companies simply hire more zero-hours or part-time staff. This is all perfectly legal, of course, but in a competitive market where businesses have to keep their costs down, it means that more and more companies will have to go down the same route to be able to compete on an even playing field. If Ed Miliband or David Cameron really want to tackle the dark side of zero hours contracts, they should pledge to impose a legal limit on the percentage of staff that any company can employ on zero hours contracts. That maximum should not exceed 10 or 20 per cent, which allows ample room for flexibility. After all, when companies pay less in tax and NICS, the Treasury loses out on vital funds. And when people can’t get the full-time work and job security they want, it is taxpayers who end up footing the bill for their tax credits and housing benefit to make ends meet. That means less money going in to Treasury coffers and more money going out. Most of us, like David Cameron, may not think we could live on a zero-hours contract but, unless something is done to limit them, we may find that we won’t get the choice. This entry was posted in zero hours contracts and tagged care workers, David Cameron, Jeremy Paxman, Sports Direct, tax avoidance, Vince Cable, zero-hours contracts. Bookmark the permalink. I really cant see the Tories tackling zero hours or PT work as this has been part of their agenda….. making work scarce, in that finding secure full time work for the poor is becoming a bit of a pipe dream, forces them to sign on for Universal Credit!! Paid Slave labour at your beck and call through fear of destitution….. forever being surveilled and monitored, ordered to look for more work, to take up anything else offered at the sending of a text….. Threat of being sent on one of their ‘Helpful’ schemes such as WorkFare or ‘re-skilling’ Work experience. all which hands over our labour for free to these large companies…..
Why would they chance this??? How can people band together and become powerful when they are constantly under threat? Fearful of losing their ability to survive? The solution would be to drop the £156 earnings limit on NI contributions. It is a hangover from the old “married women’s” NI where their husbands’ NI already provided cover. As so much more is becoming contributory, and state pension always has been, any work that fails to have NI cheats the employee of future benefits. Over a working lifetime the government will change umpteen times, so more or less being on contributions will also bounce around, but at present it is our best way of ensuring access in the foreseeable future. It should not be possible for anyone to work and NOT make NI contribution, and it would add to the NI Fund.